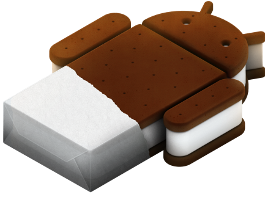 Today we are announcing Android 4.0, Ice Cream Sandwich &mdash; a new version of the platform that brings a refined, unified user experience for phones, tablets, and more. Android 4.0 builds on the things people love most about Android &mdash; efficient multitasking, rich notifications, customizable home screens, resizable widgets, and deep interactivity &mdash; and adds powerful new ways of communicating and sharing. It includes many great features for users, including social and sharing integration, network data usage control, innovative connectivity and camera options, and an updated set of standard apps. Deep interactivity and customization: Improved notifications, lockscreen with camera and music controls, ;and improved app management in the launcher.